Senarai ini diperoleh dari Blockchain Insider terdiri daripada individu yang paling berpengaruh dalam industri Blockchain, dan aktif dalam mengemaskini perkembangan terbaru teknologi Blockchain dan cryptocurrency. Sekiranya anda seorang pelabur, trader atau yang terlibat dalam dunia cryptocurrency individu-individu berpengaruh ini perlu anda tahu bagi kemaskini berita dan perkembangan terbaru. Senarai Richtopia Blockchain disenaraikan mengikut ranking berdasarkan beberapa metrik utama antaranya ialah profile social media dan liputan daripada media massa. CEO @CivicKey ($CVC), building global blockchain ID platform. General Partner @multicoincap Expect Crypto/Bitcoin tweets, often sarcastically. Economist & investor. Mostly Bitcoin. @KeiserReport @HeisenbergCap Skin in the bitcoin game since 2011. Commentator, evangelizer, investor and student. Gold, Silver, Bitcoin. i don't sleep, i wait. investing. evolving. creating. teaching @MIT @UniofOxford. advising @WEF. founding team @dcgco. In the future, everyone will be famous for 15 megabytes. Mark van Rijmenam is founder of dscvr.it and datafloq, an internationally renowned big data and blockchain expert, author and speaker. Oliver Bussmann is a Global FinTech Executive, Advisor, Keynote #Speaker and Blogger. 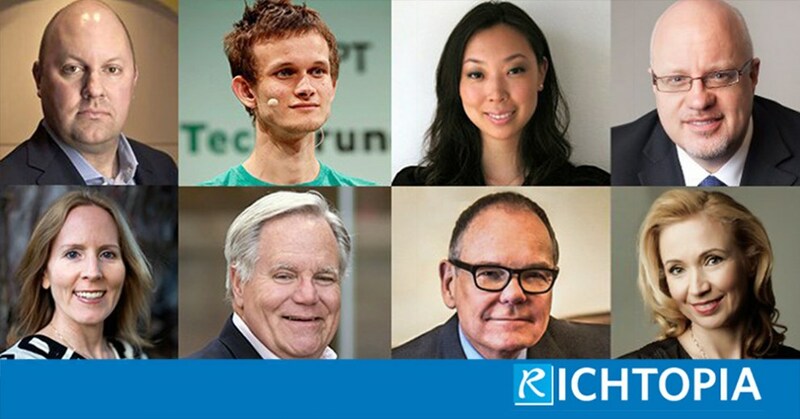 Top 10 #FinTech #Blockchain #ICO Influencer. #entrepreneur/#advisor/#investor in #blockchain since 2013, run Transform Group (#1 PR/advisory firm, 75 ICOs), #CoinAgenda, #BitAngels. Founded Marketwire. Prof @edinburghnapier Probe edges of science in Cyber/e-Health. Serial innovator. Believer in fairness, justice & freedom. Crypto Geek. EU Citizen. Cyber Punk. Author, The Business Blockchain. Producer, Token Summit. Venture investor & Advisor. Founder, Startup Management. Mentor, Entrepreneur, Speaker. Thought Leader. Husband, father, builder, CEO @BloqInc, CTO @Space__Chain, proud son of a USMC F-4 pilot. MD #buzzvault currently bringing home #insurance revolution. Veteran of the #insurtech business world, #actuary, #innovation freak and motor #telematics expert. Markets reporter and blogger for Bloomberg News in New York, focusing on crypto and LatAm. Previously, Madrid and Buenos Aires. Usual disclaimers. Chilena. Co-founder & President @Unocoin, India's Leading #Bitcoin Company. Investors are @DCGco @BoostVC @FundersClub @BankToTheFuture @FuturePVC & @BlumeVentures. Crypto, engineering, philosophy, learning to learn. Previously co-founder @coinbase. Tweets from the UK's interim Government Chief Scientific Adviser, Professor Chris Whitty, and the Government Office for Science. such bubble. we are in a parody. founder: https://t.co/oYqaZjuxIC. co-founder: @cointelegraph. faith in humanity, idealistic realist, peace warrior. Empowered Woman.